Falling asleep when driving is extremely dangerous for you and for others. Figure out why this happens and how you can stay alert while driving to be safe. Falling asleep while you're driving can be dangerous, both for you and others on the road. Feeling drowsy behind the wheel is a very common phenomenon, but becoming so tired that you fall asleep at the wheel can be a sign that you may be suffering from a serious sleep problem that will need to be addressed. Nodding off for as little as three seconds while you are driving can cause a fatal accident. Even driving while drowsy can slow your reaction time enough to increase your risk of serious accidents on the road. Sleep loss is one of the most common causes of drowsy driving. Many conditions can cause the patient to suffer from sleep deprivation. Personal demands, stress or lifestyle choices can cause people to miss the 7-9 hours of sleep they need. Troubled sleep may also fail to provide adequate rest, causing the patient to feel drowsy throughout the day. Undiagnosed sleep disorders or sleep disorders that are not being treated properly can cause you to feel drowsy throughout the day. These symptoms can be worsened when performing repetitive activities such as driving. Noting your other symptoms and working with your doctor can help you learn if you have sleep disorders such as restless leg syndrome, narcolepsy or obstructive sleep apnea that could be affecting your ability to perform tasks like driving safely. Narcolepsy- Narcolepsy is a chronic condition that affects your ability to properly regulate your sleep schedule. Narcolepsy is caused by environmental triggers that induce your brain to rapidly release the chemicals which lead you to fall asleep. This can cause sudden loss of muscle control, strong emotions or severe daytime fatigue. You may also notice nighttime wakefulness, sleep paralysis, rapid entry to REM sleep or hallucinations. Your doctor can perform a spinal fluid analysis, nocturnal polysomnogram or multiple sleep latency tests to determine if you suffer from narcolepsy. Obstructive sleep apnea- This condition causes the patient to stop breathing while you are asleep. This can be caused by the airway becoming blocked or conditions that cause the airways to become floppy or narrowed because the body relaxes to the point where the muscles that regulate your breathing do not function properly. Sleep apnea can cause patients to become forgetful, grumpy, impatient or suffer from headaches. They may fall asleep during daily activities because they are not getting the rest they need at night. Doctors will perform an ECG, echocardiogram or an examination of thyroid function and arterial blood gasses to check for sleep apnea. Restless leg syndrome and periodic limb movement disorder- Restless leg syndrome or periodic limb movement disorder commonly coexist in patients. In combination, these conditions can cause insomnia, excessive daytime sleepiness and daytime fatigue. It can also cause difficulty when you try to move your limbs, which can result in you losing control when performing activities such as driving. Patients that seem to be showing signs of limb movement disorders can go over these concerns with their doctor to determine if they have a condition that requires treatment. Medication can often be prescribed to help avoid falling asleep while driving in such cases. The circadian pacemaker or biological clock is the body's natural mechanism that tells it when it is time to sleep. This mechanism sends the signals to the brain and tells it to get sleep in the mid-afternoon and at night. If you are working a job at this time or performing stressful tasks you can become susceptible to falling asleep during these activities. Alcohol is a depressant which will increase feelings of sleepiness or fatigue that are present. Some medications also list fatigue as a side effect. Ingesting these substances, such as antidepressant, antihistaminic, benzodiazepine and antipsychotic before driving can be dangerous. If you are taking a medication for the first time, avoid performing activities like driving until you know how they will affect you. In order to maintain optimum health, people should get between 7-9 hours of sleep per night. But activities such as working late, worrying about personal issues or choosing to stay up late to socialize can interrupt this natural sleep schedule. Consistently interrupting your sleep schedule or failing to get an adequate amount of sleep per night will cause you to become drowsy during the day. If this condition is not addressed you can find yourself falling asleep while you try to function throughout the day, which may include falling asleep behind the wheel. One of the most important tips to avoid sleepiness while driving it so make sure you get enough sleep every night. Make a point of setting your schedule so you can get 7-8 hours of sleep each night. Try to go bed around the same time every night and get up around the same time every day to allow your body to become used to this schedule. Getting restful sleep is also a key to avoiding fatigue during the day. Avoid eating big meals before bed and avoid consuming alcohol for at least three hours before going to bed. Avoid substances like caffeine for at least six hours before you try to sleep. 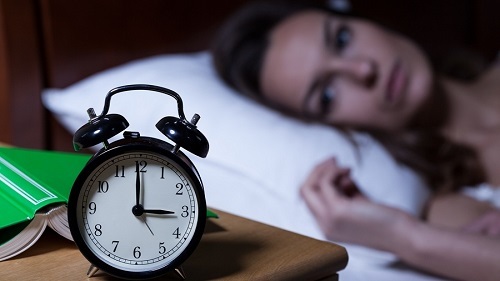 If you have trouble sleeping, make sure you have a comfortable room to sleep in that is not disrupted by uncomfortable temperature, excessive light or noise. Since falling asleep while driving is so dangerous, you should know these tips to keep you on the safe side. 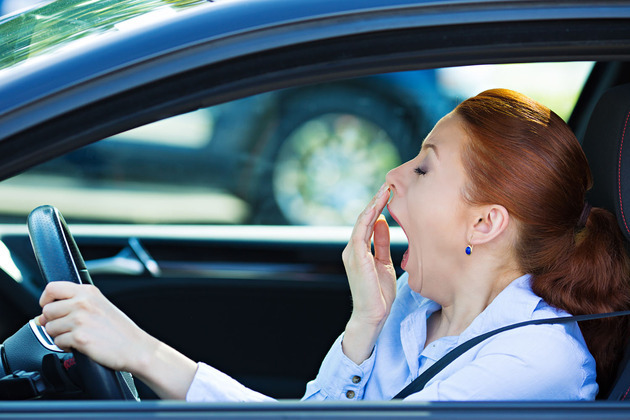 Try to avoid driving when you are feeling drowsy. If you will be driving for a long period of time, avoid using the cruise control setting. Staying actively involved with your driving can help you stay alert. If you find yourself becoming drowsy or distracted, keep the car cool to help promote alertness. Listen to music or get involved with an active conversation to help relieve the monotony associated with driving. Avoid driving for long periods at night or driving for long distances alone. If you must travel long distances, make a point of stopping at a rest area every 1-2 hours to exercise and increase your energy level. If necessary, stop in a rest area to take a 15-20 minute nap to avoid falling asleep behind the wheel. Once you begin driving again, make a point of sitting up straight. Slouching down in the seat can promote sleepiness, particularly if you are driving at night.